Amazingly beautiful genre picture. 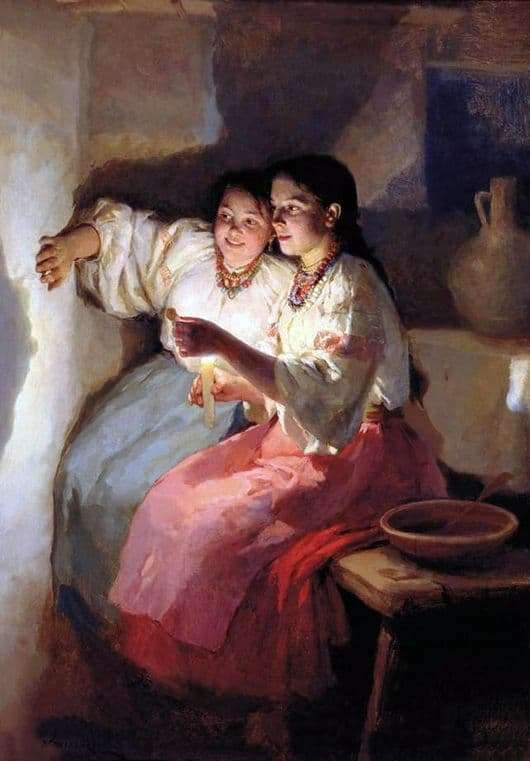 Two beautiful peasant girls sat on a bench by the stove and began to guess at the candlelight at Christmastime. And what about without it! Then at Christmastime, this is perhaps the most important thing – to tell fortunes to the contented-dressed! After all, the girls really wanted to get married as soon as possible. And guessed at Christmas time in different ways. That’s what’s on the canvas just the right thing. Some water was poured into the cup, a candle was lit, and wax was poured into the water. He froze there in various forms, and then with the help of a candle they looked at the shadow of this very waxy frozen blot. Viewed intently to unravel the profile of a loved one. That’s just for viewing the artist and found his heroines. They attentively and cheerfully look at the shadow emanating from the candle – they suddenly see what is familiar. But the most interesting thing is that such Christmas divination came true almost in a year. As a rule, all Russian weddings coped in the fall, almost immediately after the harvest. Work has become smaller and therefore it was possible to indulge in entertainment. And then the wedding was celebrated on a large scale. By the way, Christmas time was also celebrated on a grand scale, but, truth, not so big. In winter you don’t go too far, but they were like a continuation of the Nativity of Christ. That is why beautiful women are dressed festively. As a rule, the girls gathered in one of the huts, without the guys and were taken to guess. But it was not long. Immediately after the fortune-telling, chants began, but also for a reason – someone spun yarn, someone sewed something or sorted out berries. Of course, the samovar was melted, and girlish tea-making began. Treats were different – gingerbread, bread or lump sugar. But then the guys came, but nothing like that happened between them, they just sat and told all sorts of stories, tales and stories.